Happy young couple getting keys of their new house. Close up of female hand receiving keys from house broker. Closeup of the hand of a real estate agent who give the house keys to a woman while her boyfriend signing a contract. Thinking of buying a home? Wondering when is the best time to apply for a mortgage in order to get the best possible rate? Mortgage rates are relatively volatile when compared with interest rates of other loan types. 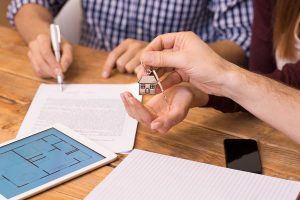 Since mortgages are typically such large sums, the rates are often an indicator of the current economy and a predictor of the future economy. Mortgage rates affect the overall housing market, referring to the average prices of homes bought and sold during the current year. If you plan to buy a new house in Greensboro, NC, this year, consider the rate predictions to help you determine the optimal time. According to The Mortgage Reports, mortgage rates have been at record lows this year, and that trend has continued into the fall. However, rates are likely to go up in the foreseeable future. Rates at or below 4 percent are likely to rise at least half a percent by the end of the calendar year. This means that if you’re thinking of buying a home, it would be wise to act quickly. If you’ve been planning to build your dream home, applying for a mortgage now is the best way to lock in a low rate. Mortgages typically have 30 year terms, and while you may have the option to refinance down the road, locking in a low rate now means you may not have to. Do you have a vision for your dream home? Is it stylish and spacious and reflective of who you are? Before you buy a new house in Greensboro, NC, consider a custom home. Custom building allows you to plan and design your home just the way you want it, down to every last detail. Every luxury, every feature that you’ve always wanted in a home can be yours. Your ideas, wants, and needs come together when master designers create a truly original home just for you. From the blueprints to the finished product, you are a part of every decision and option. And the final result is a home you can be proud of, make memories in, and live life to the fullest. Your money should go toward adding luxuries and beauty to your new home, not to the bank in the form of mortgage interest. With rates low but poised to move, this is your time to take action. Get a low rate locked in now before the rates rise. Then simply enjoy the custom design process. R&K Custom Homes makes designing your dream home a truly wonderful experience. Ready-to-build home sites are available now in some of the finest neighborhoods in Greensboro. Call (336)643-3503 to schedule a consultation.